Download the application below and send via fax to (832) 761-0151 or email Don at: amch.don@sbcglobal.net. Mail all checks to our P.O. Box address found on the Contact page. Total Masonry Construction can help you reach your goals of building beautiful, safe, secure, and economically-sound learning environments for our children and safe havens for our community. Masonry Construction is a real brick-and-mortar commitment to a solidly built community core. One that will serve us just as well 100 years from now in the day-to-day task of educating our children as it will protecting our families during the chaos of a natural disaster. You and your neighbors in the Houston area depend upon public education facilities, whether they have children enrolled or not. You vote there, evacuate there, cheer on the home team and attend top-notch theatrical productions there, and you send your tax dollars annually. Like any investor, you expect a good return on their money. Our schools prepare our children to be tomorrowʼs leaders. That is, no doubt, at the heart of our mission. Our schools say much about our community – AND about those who run it. The AMCH has produced a 20 minute presentation describing the economic and scholastic advantages of masonry construction for school districts. An AMCH representative will be happy to make this presentation to you or your group in your offices and at your convenience. Please fill out the form below and enter at least two dates you would like to see the presentation. We will get back to you shortly. The Associated Masonry Contractors of Houston share a common goal with the administrative and educational leaders or the school districts in the Houston area– providing the best education possible for our children. The degree of our success rest on the shoulders of teachers to hone their skills and provide the dedication necessary to inspire and challenge our children to constantly grow scholastically and socially. It also rest on the district administration and the design and construction industry to provide the most conducive environment in which the education process is to take place. The masonry industry believes it plays an unmatched role in providing that environment. For this reason the Associated Masonry Contractors of Houston established its “Building Our Future” Scholarship Fund. It has set aside $35,000 to award $2,500 to the educational foundations of each of the school districts who recognized the importance of The scholarships will be sent directly to the Foundations to support the higher education of a deserving student, or students, solely at the foundations’ discretion. The appearance of your facilities creates a lasting first impression. It is a permanent front-line PR force, speaking to your constituents about your values and priorities. While beauty in a facility is often considered the icing on the cake, you canʼt dismiss the key role it will play in building goodwill for your district among residents. This attribute makes its all-important first impression well before the first day the school is occupied. From the day your outer envelope is in place, people will be talking, for better or for worse, about what the school looks like. They wonʼt have formed an opinion of its safety attributes yet, and they will not have started contemplating its long-term value, but they will call it “pretty” or “ugly,” an asset or a liability, as they walk the grocery store aisles, meet at the water cooler or visit over their back yard fence. The beauty of masonry construction is multifaceted because of the many different products it encompasses. The “look” of masonry can range from stately red brick to modern glazed block to the rugged elegance of stone and beyond. And masonry is not only for exterior walls. With masonry’s limitless choices of textures, colors, and contrasting sizes it creates energetic and soothing environments equally as well. There is truly not a style that you or your architects can dream up that cannot be accomplished with solid masonry construction. Itʼs important to note that beauty really is more than skin deep. To reap the safety and value benefits of the product, masonry must be more than just a veneer. Masonry construction is not a facade, but a total building system that forms the basis of a buildingʼs structure. What about tilt up construction? Itʼs masonry, right? No. It’s not and it does not perform at the same level as a masonry wall system. Tilt-up has been used successfully in various types of buildings, large and small, but is especially popular in warehouse and strip mall construction where aesthetics are not a primary concern. To illustrate the difference between the two systems, the Texas Masonry Council conducted a research project that followed two schools, one masonry and one tilt-up, built in 2006 by Central Texasʼ Leander ISD to document the different outcomes of these two building systems on otherwise nearly identical schools. The results, just released in August 2010, provide an insightful look into the employment of two divergent construction methods for two comparable facilities. The cost of the two schools were almost identical. Those involved in these projects and in the Leander community the schools serve have made the following comments about the impact of the schools’ appearance. Bobby Kincaid, project manager for Pfluger Associates Architects, L.P., the firm that designed the masonry school noted the ease with which wall directions are changed and offsets and curves built with masonry construction, adding that these actions are not easily accomplished with tilt-up. In an informal survey, 75 percent of teachers said the masonry school was more attractive than its tilt-up counterpart. As important as the curb appeal of your facilities are, once kids walk into that building, parents will want to know, beyond a shadow of a doubt, that it is a safe place for their kids to learn. There are three specific areas we want to address when it comes to creating a safe environment for your students using masonry construction: mold, fire, and wind. The simple reason masonry withstands two of these elements so well is that it doesn’t contain the “food” that fuels either mold growth or fire. Both of these phenomena require nutrients if they are to take hold, and cellulose is their food of choice. Wet cellulose materials including paper, cardboard, drywall and wood are particularly conducive to the growth of mold, while the same materials serve as kindling for flames. Mold, the most-talked about and most litigated villain in the educational community in Texas and beyond. It’s microscopic in size, yet has cost school districts millions of dollars during the past two decades. The magnitude of the problem stems not from construction imperfections – entry points for water – roof, wall and plumbing leaks, but from building materials’ inability to forgive such imperfections. These materials are often cellulose based – like drywall – or lack the breathability necessary for moisture release – like EIFS. The result? Buildings meant to last a half a century or more were failing after only a few years. The new buzz word in this arena is IAQ, Indoor Air Quality. Mold is one of the major factors that can negatively affect your schools’ IAQ. Poor IAQ translates into increased absenteeism among students suffering from asthma and increased maintenance and remediation costs for districts. The American Lung Association found that American children miss more than ten million school days each year because of asthma exacerbated by poor IAQ. With one of the highest average relative humidity levels in the country – rivaled only by Seattle – the Houston area is always going to provide conditions conducive to mold growth. The answer: Masonry construction –when used as a building system that encompasses both interior and exterior walls – goes a long way toward eliminating the habitat mold needs to proliferate. Add terrazzo tile or some other water resistant masonry flooring, and you’ve taken care of all your exposed areas except the ceiling and roof. If there is one underlying theme of this entire presentation, it’s why not do it right the first time rather than go back and fix it later? Masonry won’t burn, melt, or emit toxic fumes. Along those same lines, what if with fire, as with mold, you could eliminate the conditions that feed it? Even with our technological age, you will never have a paper-less school. Paper and other flammable materials are a part of our lives, but they don’t have to be a part of the building system that encases our students and staff. If flames ignite but don’t find adequate fuel, they won’t do much damage. A masonry wall system reduces the risk of your building collapsing and continues to stand as an effective barrier between fire and your students long after other wall systems will have failed. are measured and rated. Masonry materials earn a perfect rating in all three, meaning they are deemed to have no propensity to spread flames, create smoke or to fuel a fire. Codes now allow exempting a school from certain fire ratings in its construction materials if adequate sprinkler systems are in place. Unfortunately, according to the National Fire Incident Reporting System’s 1996 data, sprinkler failure was found in almost 40% of the total fires reviewed. More recently, American School & University reported in its May 2010 issue a more optimistic 90% success rate for sprinkler systems. This means that 90 percent of the time sprinkler systems will do their job as promised, while 10 percent of the time, whether due to human or mechanical error, sprinkler systems will not provide any of the protection you are counting on to ensure the safety of your students or protection of your facilities. The benefit of a “passive” system like masonry construction and other fire resistant building materials is that they are there when you need them. Period. Its fire rating is good for the life of the building which could be a century or more. Mold. Fire. Now – Wind. School districts in the Houston Area have a vested interest in construction that can withstand hurricane force winds. Masonry construction is cited again and again as one of the common denominators among buildings that survive hurricanes and other high-wind conditions. A 2004 study conducted by the Wind Science and Engineering Research Center at Texas Tech University demonstrated that a medium-sized wind-blown object, such as a 7.5-foot long 2 x 4, would penetrate walls built with vinyl or fiber-cement siding at a speed of 25 miles per hour. By comparison, the same object would need to travel at a speed exceeding 80 mph in order to penetrate a brick wall, even if it were only a veneer with traditional wood-frame construction – not a masonry wall system. While total masonry construction, like Brick Veneer over Reinforced Concrete Block, wasn’t included in this particular study, data and the resulting building codes indicate that solid masonry infrastructure is the optimal system for storm resistance. Examples of a masonry wall system’s structural integrity in the face of hurricane-force winds can be seen in these photos of the Bolivar peninsula and Crenshaw Middle School after the devastating landfall of hurricane Ike. The Whole Building Design Guide, published by the National Institute of Building Sciences, recommends only two types of exterior wall construction for achieving the enhanced missile resistance necessary to weather a hurricane unscathed : reinforced cast-in-place concrete or reinforced and fully grouted Concrete Masonry Units. The Guide goes on to say that of the two, reinforced CMU offers greater reliability (i.e., they have no coverings that can be blown off compromising the wall system’s structural integrity or contributing to hazardous, life-threatening, flying debris.) Hurricanes top the list of potential threats that cause parents in the Houston area to be more anxious than ever about the safety of their children. Our schools are expected to be safe and “secure havens” for our children on a daily basis AND for our communities during times of major crises. Most masonry manufacturers guarantee their products for 50 years of more. Yes, your community wants beautiful schools. And, naturally, they want them to be safe. But, ultimately, your constituents want to know that they are getting all this at a good value; that you are using their money to build a future for the entire community, not just a disposable structure to serve current needs. Long term, solid value case studies. Dallas-area Mansfield ISD, one of the fastest growing districts in the state. It chose to build virtually all of its 20+ new schools using masonry construction. Some might look at the magnitude of that building project and wonder why they would opt for what is perceived as a more expensive construction method. A Dallas Morning News article featuring a school-by-school comparison of new facilities built in the Dallas area during the same period included found that Mansfield High School, built entirely of Brick Veneer/Reinforced Concrete Block, to be the least expensive of the four schools reviewed. This is particularly impressive when you consider that the district now has a school that will perform optimally for 60+ years with minimal maintenance and no unscheduled repair costs to the district. Bill Plummer who retired as Aldine ISD’s Deputy Superintendent for Operations in 2002, says that in his 35 years with Aldine ISD, he learned that “masonry buildings are ageless,” noting the district’s 60-year-old masonry built schools perform as well as the brand new ones. His only caveat? “Choose your colors carefully!” This is particularly true on the decorative and structural indoor surfaces. Add terrazzo tile on your floors and the ceramic block on your walls and your decisions will be with you a lifetime. Make sure you like them! We would also suggest taking advantage of the current economy. Tomball Memorial High School, Tomball ISD is currently under construction using predominately steel stud and drywall systems at a cost of $168 per square foot. Ella High School, Aldine ISD was bid in December 2009 using predominately masonry wall systems and glazed tile at a cost of $126 per square foot. The initial cost savings with the superior wall system are dramatic and the historically low maintenance cost of masonry is well known. Canton ISD Superintendent Larry Davis proudly boasts that students have a hard time vandalizing the masonry structure of his schools. Mr. Cash agrees, commenting, “Children are not destructive by nature, but if there is something that can be messed or broken, it’ll happen. With masonry construction, we do away with a lot of the vandalism.” Mr. Plummer asserts that “masonry just will not wear out.” He cited the fact that students can’t knock holes in it or cause any permanent damage by marking it up as examples of masonry’s ability to withstand the wear and tear necessary for a school environment. Masonry Wall Systems are Green. It’s key to remember that masonry products are not merely decorative and structural materials, but Green materials too! A natural insulator, masonry’s ability to absorb and release thermal energy over an extended period makes it an ideal choice for reducing peak energy loads. According to the Institute for Sustainable Energy, simply by incorporating high-mass masonry wall systems, cooling loads can be reduced and HVAC equipment can be downsized, translating into cost savings for the district. But the value of masonry construction goes well beyond the LEED points it can contribute to your project, masonry’s low maintenance and repair expense, and masonry’s ability to lower energy costs by reducing energy demands during peak-use hours. Masonry construction creates beautiful, safe, secure and healthy learning environments for students, teachers and for our communities that will last long into the future. With masonry, you actually are building the future. That’s peace of mind worth investing in. The Associated Masonry Contractors of Houston, in association with the Texas Masonry Council, wish to recognize and encourage excellence in all phases of masonry construction. 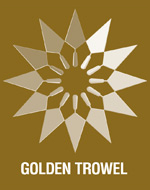 The Golden Trowel Award is to be awarded annually to an Architect, a General Contractor or Owner, and a Masonry Contractor demonstrating excellence in their respective contributions to a masonry project deemed worthy by a distinguished panel of judges.